Content marketing. 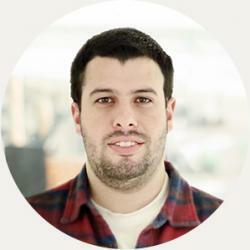 It's a “big deal” in today's online marketing world. It seems like everyone is talking about it. Done correctly, content marketing can be a tremendous asset to almost any company's marketing efforts. It can build thought leadership, trust and credibility. It can attract interested shoppers who want to know more about how you can help them solve a problem they are tired of struggling with. Or who want to find out how you can in some other way add value to their lives. Note – there's a major hint in the last two sentences; they contain a big “secret” to content marketing success. Keep reading to find out more. But the content marketing outlook isn't all “sunshine and rainbows”. There's a big problem facing a lot of marketers and business owners trying to harness the power of content marketing. Much, perhaps even most, marketing content is largely ignored. Obviously, to have the effect you want it to have, your content needs readers. This is the content marketing “trifecta”: writing great content, getting it read and getting it shared! If you are going to succeed at harnessing the power of content marketing to help you win new business, if you are going to keep the attention of interested readers and make them want to return to your content again and again, if you are going to persuade them to share your content with their friends and social networks, you need to write good, preferably GREAT content! 1. Is Your Content Great? So what constitutes great content? Great content solves a problem the reader is struggling with, or it helps him accomplish a goal. Even though your ultimate content marketing goal is to convert readers into buyers, you want to write content that is chock full of valuable information the reader can benefit from even if he never becomes your customer. You want to write content that is focused primarily on the reader and how you can help him, not focused on your product or service and your company. You want to write content that is easy to read. If reading your content is hard work or a tedious chore, it won't resonate very strongly with your audience. Many of them will quit before they reach the end of your content pieces. Also, it WILL NOT get shared. Write content your readers will find easy and pleasant to read. Learn to write “conversationally”, informally and to an “audience of one”. Imagine you are having a lively conversation with much “give and take” with an old friend over lunch or coffee. To the best of your ability, write like that. To write the most compelling, interesting and engaging content possible, follow the rules of solid copywriting. And speaking of using copywriting techniques to produce content likely to get read often and more likely to get shared, you must pay attention to your content's title or headline. Or in the case of email marketing, your subject line. Your title needs to capture and keep your potential reader's attention. It needs to arouse an emotional response in him. It needs to hint at a benefit he'll enjoy by reading your content and doing what it says. And your title needs to make him extremely curious to find out more. Think about this quote for a moment. Think about how your mental and emotional state before you write and while you are writing affects the quality and tone of your content. As you write, are you actively enjoying the process? Are you passionate about your topic? Do you wholeheartedly believe in your product and its ability to help your content readers solve a pressing problem(s)? I'm convinced beyond the shadow of a doubt that the way you feel when you are writing affects the quality and persuasiveness of your content. I believe your readers, as they read, will often feel the emotions you feel as you write. So what's next? You've written some wonderful content – content worth reading and sharing. Now you have to get it read. If you're a fledging content marketer and only publish it to your blog and never tell the world about it, it will probably get ignored. So tell the world about it! Whether it's a new blog entry, a white paper or webinar, announce it to your social media networks. When you do, use your headline writing skills to persuade your social media followers to click on that link to take a closer look at your content. Tell your email list about it. In some cases, you might want to leverage the power of search engine marketing to tell interested searchers about your content. And of course, remember your SEO keywords. But don't get carried away here. Write for people first and Google second. If you “stuff” or overload your content with too many keywords, you might get lots of traffic for your content, but you'll turn off most, maybe even all of your readers, and your content won't get spread. Here's another proven method for getting your content seen by more eyes: guest blogging. Strike up a relationship with a prominent blogger in your niche, and offer to write one or more article for his blog with the condition that you get name recognition for your work and you get to link back to your website. Congratulations! You're steadily producing great content. Your audience is growing. Wouldn't it be nice if your enthusiastic audience now became your enthusiastic “content evangelists”, your “content sales force”? Write valuable, interesting content that they themselves love reading, and many of them will be happy to share it for you. Make it easy for them to share. Add social sharing features to your email templates and blog. And feel free to ask them to share it for you, if they like what they've read. We're all familiar with the term viral content. It's easy to focus on “going viral” when we think about ways to spread our content. On this blog, we'll soon be publishing an article on viral content. But for now, understand this: your content can go viral and it won't necessarily increase your sales. For high conversion rates (much more important than your content going viral), it's better for you to have 1,000 readers that buy from you than 1 million who love your viral content but never buy anything. In your well-rounded strategy to get your content spread, especially in the B2B world, there will be times you want to offer specific pieces of your content only to those who register for it and give you their email address. You will want to “sell” potential readers on trading their email address and other relevant information for your valuable content. And just like you would for an e-commerce sale, this is a situation where you definitely want to use a first rate landing page. Also, remember that the ultimate goal of content marketing is more sales. And if you run an online store, you want to use landing pages in this sales process. “Why do I need a landing page?” you may ask. Here's why: As we've said before, the online marketing process is fragile. When he's on the web, your potential customer is being bombarded by distractions that can take his focus away from the task at hand, the “moment of truth”, the decision in front of him to convert from a reader or shopper into a customer or not. A great landing page eliminates or lessens many of the distractions of the web environment, distractions that can kill your conversion rate. It serves to focus more of your prospect's attention on what you are wanting him to do – convert from a reader into a buyer. Easy-to-use drag and drop editing tool – As a business owner or manager, you've already got a lot on your plate. You don't want to have to take the time and effort to try and learn a complicated programming language. With Lander, you don't have to! Indeed, Lander is loaded with useful and valuable features, far more than are listed here. So why not try Lander today? Here's some great news: you can take any of our landing page templates on a “test drive” for free and with no obligation! 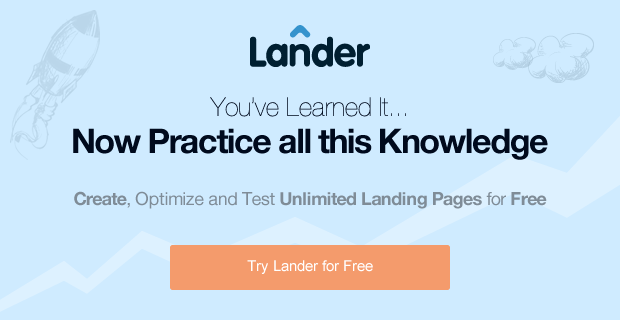 Any questions about Lander and how it can help you launch your online marketing campaigns into the stratosphere? Contact us today! We have answers, and we'd love to visit with you!